Forced to hire domestic labor, Piss-Off Airlines first spotted trouble in their parcel-delivery division ... something they attributed to a faulty conveyor belt system. Tuesday, November 20, 2018: It remains a gorgeous ocean out there. OK, so maybe it’s overcast and was spitty earlier but the ocean water is immaculate – a fine light green/blue tint. Wind-wise, I can’t imagine any boat bassers staying in port today, short of the previously mentioned need to get in some worktime prior to the long holiday weekend. That said, I have also detected a significant downturn in what had been banner boat bassing. 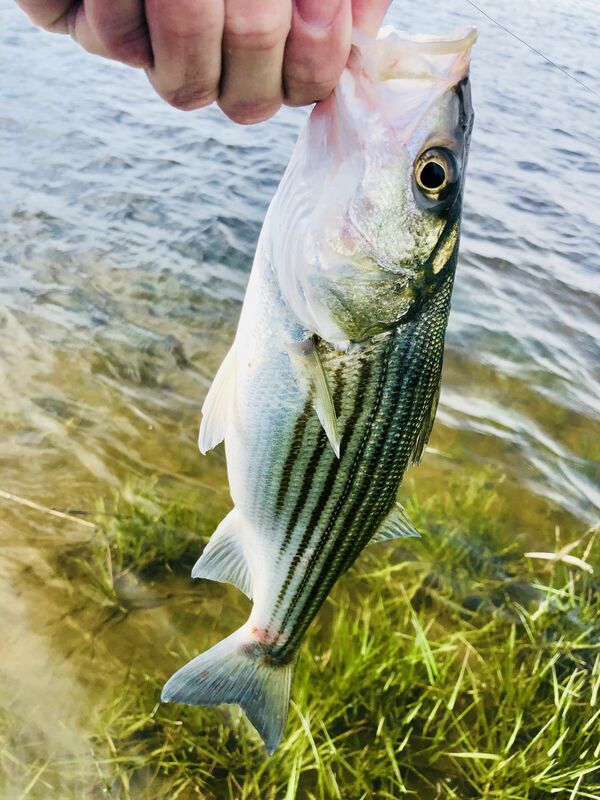 Not sure if this could be a big seasonal turn-off or simply a pause before further-north trophy stripers move on-scene. Like this. Just this a.m.
Jumbos now!! Jigging plastics, very close to beach now and close to home! Theoretically, the schoolie showing should soon be astronomical. Once again, the boat people will have a monumental advantage over surfcasters and bank anglers. Here’s hoping a late-day near-beach schoolie charge kicks in … starting today. As hard as I try, I can’t help being optimistic despite this continuing to be the worst fall surf run of stripers possibly in modern history. Nonstop schoolies would ease the surfside stripering pain. I’ve already gotten two emails asking for gift ideas for the angler/outdoorsman. Yes, for your sakes I’ve mentioned Van Staals and a new loaded Chevy Silverado 4X. I’m working on a more practical list, though my quirky tastes in gadgets is far from everyone’s cup of gift tea. By the by, I got my four-pack of Trac-Grabber x4 -The Get Unstuck Traction Solution for Trucks and SUVs. They’re quite decently made. I simply refuse to purposely sink my truck to see if they work. The video evidence of their effectiveness is mighty impressive, though. I placed one on a tire and it was quite easy to apply, though it sure seems like too little to free a badly bogged down truck. Still, the videos show absolutely chassis-stuck trucks busting out of entrapment with Trac-Grabbers. My remote tire-pressure gauge gadgets are great … but not for me, per se. They go on each tire valve, then remotely communicate psi info through a dashboard-mounted reader. I had hoped to monitor my purposely low 25 psi buggying tires to make sure I wasn’t leaking air, which happens all too often when you frequently air down and air up for beach going. Upon testing, the reader perfectly displayed the tire pressure in all four tires, separately. The problem for buggyists is the fact each tire gauge leads to a warning sound if tire pressure is low – which it always is on a beach-ready buggy. It’s not a total loss, though. I can still monitor my tires, once filled to proper road psi levels, to make sure buggying didn’t throw a sand grain into a valve cap, easily leading to a slow leak capable of fully flattening a tire, especially overnight. Waking to a flat tire on a soaking or frigid morning is an all-time a.m. pisser for me. Once pancaked, a tire can’t be refilled unless the truck is jacked up. One of my better buggying-related buys was a rugged Porter-Cable 6 Gal. 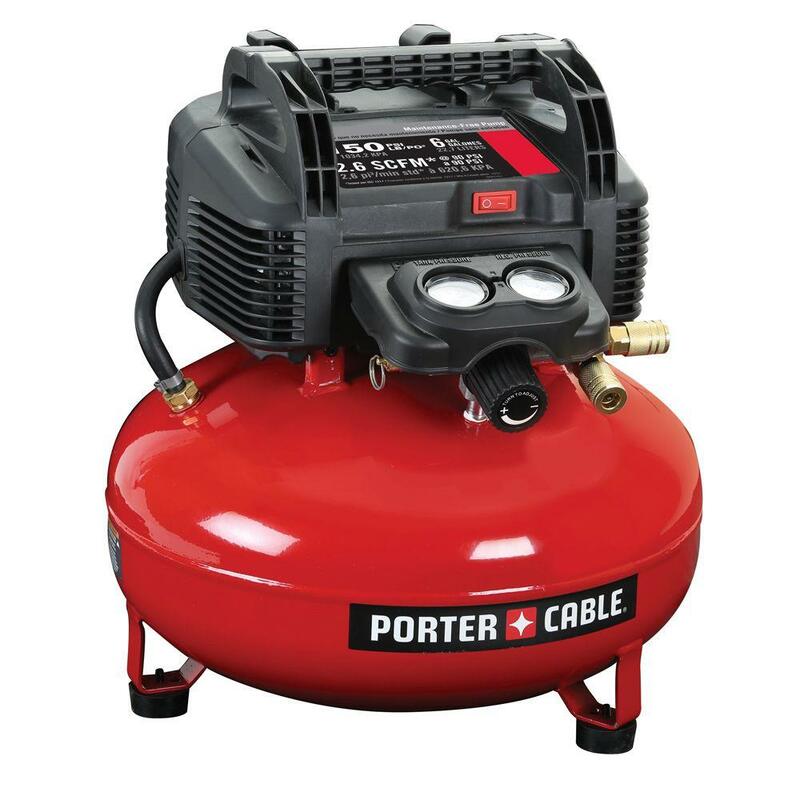 150 PSI Portable Electric Pancake Air Compressor. This is an entry-level compressor but quite adequate for nonprofessional applications. I keep it at the ready for faster post-buggying tire refills. I also call on it to sandblast the likes of iron Colonial-era metal-detecting finds. Pure iron (Batsto-like) cleans amazingly well, though such cleaning should only be done on certain artifacts, most need to be left totally untouched to maintain historic accuracy. Then there’s my pulling out the compressor to instantly age/distress wood and driftwood for artwork, using a garnet grit fed into a tightly nozzled sand gun. Googles a must. Far and away my most used gadget has been the NOCO Genius Boost Plus GB40 1000 Amp 12V UltraSafe Lithium Jump Starter. You are crazy not to have one of these – charged up and at the ready. I have used mine maybe a dozen times, helping dead-battery folks – who look at the small contraption with doubt that it can instantly start their vehicle. Bam! Engine starts right up. I had to self-use mine last week when I left too many things in my “lighter” sockets. There are many of these now, some with USB ports and such. I fully back the Genius Boost Plus as tried-and-proven. WELCOME LENAPE: Just a quick and highly-belated welcome officially home to the state’s 3,000-member Nanticoke Lenni-Lenape Tribal Nation. Trenton has just announced, via Attorney General Gurbir S. Grewal, that a legal settlement has been worked out whereby New Jersey has legally and officially recognized the American Indian Tribe … since 1982. Huh? No, that isn’t me writing in an unclear manner. The state has essentially legally backtracked to officially accept the tribe in an after-the-fact manner, which will allow it to be historically recognized, garnering the Tribe a total of $2.4 million under a settlement agreement. The State has also agreed to formally notify all relevant state and federal agencies of the Tribe’s official recognition status. In former legal language out of Trenton, there was due confusion over the Tribe even being here. That reared up within the U.S. General Accounting Office, which had been advised that the Garden State recognized no native American tribes. For the members of that historic tribe still living here, that offered an ax to grind – seeing they were here long before Trenton was even named same. Oh, it should be added that this official State recognition does not provide the Tribe with federal casino gaming rights. To its credit, the Nanticoke Lenni-Lenape Tribal Nation declaimed any interest in casino gaming rights. Tog fishing was as good as it gets today. Fished with Dave, Blake and Dave Rooney. Left out of Bl and headed north to some new waters. 4 Man limit by 9 and another 50 or so keepers By noon. Jigs were lights out. I fished the IRT 300 on 8 foot cts. The Reel is a beast and is the perfect Tog Jig reel. Rod I learned today is a touch under gunned for the big boys. No big fish today 8 lbs largest but avg Gish 5-6 lbs. all solid fun fish. 45 feet of water was ticket. My son caught his first Striper tonight! KING COD...11/20, BEST STRIPED BASS JIGGING TRIP OF THE YEAR....AND THATS SAYING ALOT!!! Some 50 countries as well as European Union member states wrapped up a meeting of the International Commission for the Conservation of Atlantic Tunas (IC...in the Croatian seaside city of Dubrovnik without reaching a consensus on quotas. "It's a setback and it's bad news," said Javier Garat Perez, secretary general of the Spanish fishing confederation Cepesca. "The industry wants to make money and in the quickest way it can," said Siphokazi Ndudane, who headed the South African delegation at the talks. "If we don't reach consensus next year, it's catastrophe," said Yvan Riva, president of the French fishing organisation Orthongel. Garat Perez pointed to Asian countries saying they "tried to avoid any measure that could affect their fleet of longliners," adding that "Europeans were prepared to make sacrifices." But one member of a coastal African nation said it was a "lack of will" on the part of the big fishing nations. "Bottom line, there are simply too many boats in the water chasing too few fish," said Paulus Tak, a senior officer for the Pew Charitable Trusts, and an official observer at the ICCAT meeting, about the bigeye tuna situation. This year you’re going to want to ring in the New Year with “marine munchies.” Whole Foods Market released their “most anticipated and innovative food trends for 2019,” and based on their fourth annual trends predictions, 2019 will be the year of seaweed snacks. 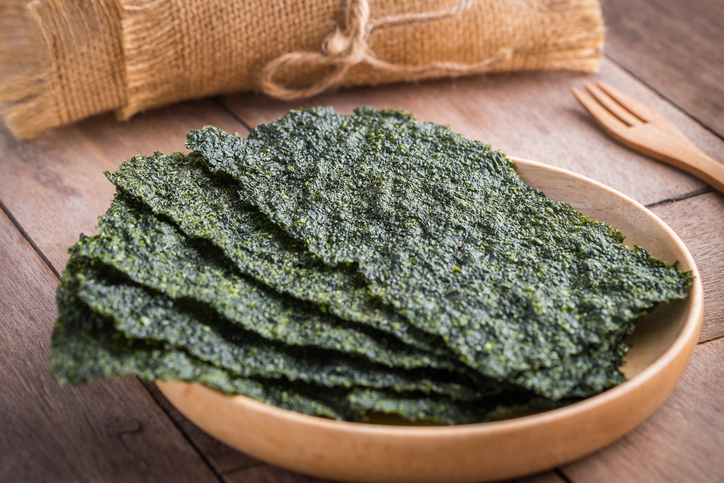 According to Whole Foods’ experts, seaweed snacks “rose to popularity” a few years ago. However, they expect “even more ocean influence in the grocery aisles in the year to come.” Shoppers can expect to see things like seaweed butter and kelp noodles. Nation’s Restaurant News reported earlier this year that U.S. consumption of seafood is growing at about 7% a year. “Sea vegetables in the higher level of dining have been growing rapidly over the past 10 years – and over the past three incredibly fast,” James E. Griffin, associate professor at Johnson & Wales University, told the outlet. Vascepa is not just any fish oil, and is different from over-the-counter supplements. Cardiologists are still grappling with clinical trial results released last week that showed that Vascepa, a fish-oil-derived drug, reduced heart attacks, strokes, and deaths from cardiovascular disease by 25% in patients who had elevated triglycerides, or particles of fat in the blood. Views range from “healthy skepticism” to a hope that the study could rank among the most important ever in cardiology. The apparently astounding benefit was paired with a number of caveats that some doctors worry could have inflated Vascepa’s apparent benefit, including a mystery as to exactly how the medicine works, a placebo that could have hurt patients, and previous studies of lower doses of similar fish oil drugs that were resoundingly negative. (Vascepa is a purified form of eicosapentaenoic acid, or EPA, a component of fish oil.) Some top researchers have visibly struggled with the results. The drama has been accentuated because Amarin Pharmaceuticals, Vascepa’s maker, is a small company with a devoted following of vocal individual investors. How much can a doctor’s opinion shift on these data? When the headline results were released by press release in September, Sekar Kathiresan, director of the Cardiovascular Disease Initiative at the Broad Institute, at first reacted to the news by saying "Wow!" When he saw the results as published in the New England Journal of Medicine, he worried about exactly how the drug was working, and said he was "probably a little too enthusiastic with my initial comment." But he now thinks his initial reaction was probably right, and that the Vascepa results constitute a major advance. James Stein, Robert Turell Professor of Cardiovascular Research at the University of Wisconsin, is a skeptic, believing that the placebo group in the study probably raised cardiovascular risk, making Vascepa look better than it was. But he’s still planning to try Vascepa in some patients. “I don’t know how much to discount it’s effectiveness,” Stein says. Even if he assumes that half of the effect was from the placebo, the benefit is still better than moving from a low dose of atorvastatin, the popular cholesterol drug, to a higher one. He doesn’t plan to prescribe the drug (or other fish oils) to people on anti-clotting drugs like Plavix, though, because it may increase the risk of bleeding. “That’s where I am today,” he says. Unlike other experts, who largely believe that Vascepa’s effects must go beyond lowering triglycerides to preventing cardiovascular disease in other ways, perhaps by reducing the risk of sudden cardiac death or clots, Armitage believes that the 44 milligram per deciliter drop in triglycerides seen in the study could explain the benefit. She points toa 2011 analysis of multiple studies of fibrates, a different type of triglyceride-lowering drug, which showed a similar benefit in patients with high triglycerides. Other fish oil trials probably failed because they used much lower doses. “It seems that high doses of fish oils are needed to gain benefit at least in this high triglyceride population,” Armitage writes. Even most proponents of the argument that the placebo in the study was harmful doubt that it increased the rate of events more than 5%; it’s the lack of a clear understanding of how the drug is working that bothers them most. But Rory Collins, the head of the Nuffield department at Oxford , argued in an email that other factors could explain the increase in cholesterol seen in the placebo group. One factor is that low cholesterol was required for patients entering the study. That could have meant that researchers were picking people at what was a low cholesterol level for them, and the levels simply returned to normal. (This is called regression to the mean.) It also could be the result, he says, of statistical quirks because the tests weren’t collected in random order — and effect that researchers could test for by going back to banked blood samples. “An effect of the mineral oil remains a possibility, but my guess would be that it is largely if not wholly an effect of the high-dose EPA through mechanisms beyond merely lowering [triglycerides],” Collins writes. He poses a provocative question: what if the Vascepa study, called REDUCE-IT, is to EPA what a 1995 study called 4S was to cholesterol-lowering drugs called statins?The 4S study, also known as the Scandinavian Simvastatin Survival Study, was funded by Merck and released in 1994. It was the first study to show that a cholesterol-lowering statin drug prevented heart attacks and, indeed, saved lives in patients who already had heart disease. It started years of debate, and the drug used in the study, Zocor, was surpassed by rival medicines made by other companies. But the statins become one of the most popular classes of drugs the world has ever seen, generating hundreds of billions of dollars in sales and saving countless lives. It’s a question, not an answer. In recent years, new cardiovascular drugs have been commercial flops even when they seemed like scientific successes. But it is a tantalizing possibility.